We are delighted to announce that our Crime and Punishment exhibition, kindly hosted by Beeches of Walkley, is now installed. The exhibition is on display in their shop window on South Road. You can see the first half of the exhibition 24/7, but need to go into Beeches during their opening hours to discover the finale to the story. The exhibition, appropriately, features boisterous butchers, as well as juvenile delinquents, dodgy pub landlords and cricket-loving policemen! The exhibition will be on display until mid-July. Beeches is open Monday while Saturday, 8am to 6pm weekdays and 8am to 5pm Saturdays. Pick up some great locally made beer, preserves, pickles, as well as sandwiches, fruit and veg, and Chris’s famous Three Lions sausages while you’re there. You can also buy a copy of the Walkley Ways, Walkley Wars book – written by the Walkley Historians. 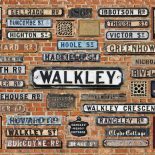 The exhibition is based on the research of Walkley Historian Hugh Waterhouse. You can his entertaining talk about crime and punishment in Victorian Walkley below. This was originally presented at the Walkley Historians’ History IS Here talks, Walkley Community Centre, Fir St on the 20th April. This entry was posted on June 20, 2018 by Bill Bevan in Uncategorized.